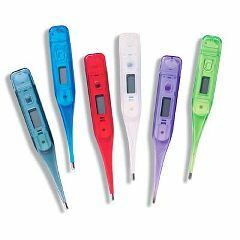 Cool Colors Digital Thermometers makes temperature taking easy with one touch of the button. Beeping responses alert you when the unit is turned on/off and when registering temperature. Thermometer is equipped with auto shut-off, Fahrenheit/Celcius option, 60-second response, and memory of last reading. Also included are multilingual instructions and 5 probe. how to change from c tof?